This entry was posted on August 30, 2013 at 3:20 am	and is filed under ** RESEARCH for A FLOOD OF EVIL, *** Uncategorized. 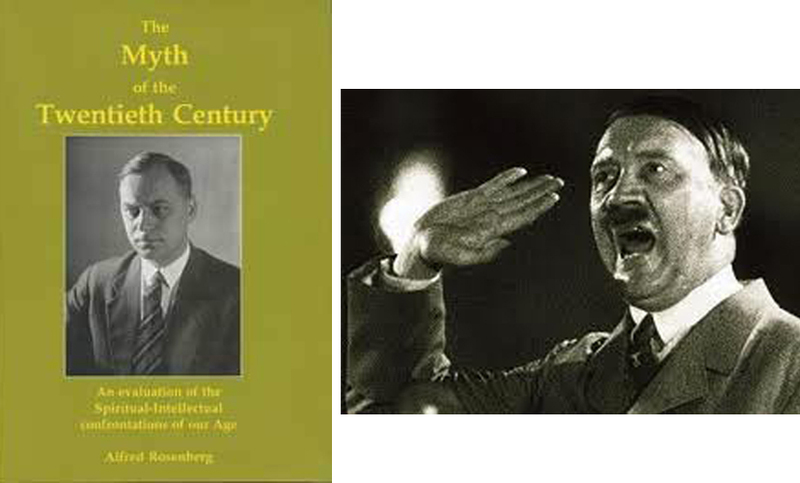 Tagged: Alfred Rosenberg, Hitler, Myth of the Twentieth Century. You can follow any responses to this entry through the RSS 2.0 feed. You can skip to the end and leave a response. Pinging is currently not allowed. Rosenberg wrote his book in 1925. It was published in 1930 and re-printed several times during the 1930s. Following the invasion of the USSR, Rosenberg was appointed head of the Reich Ministry for the Occupied Eastern Territories. He was captured by Allied troops at the end of the war. He was tried at Nuremberg and found guilty of all four counts: conspiracy to commit crimes against peace; planning, initiating and waging wars of aggression; war crimes; and crimes against humanity. The final judgment against him named him one of the principal planners of the invasions of Norway and the Soviet Union. It also held him directly responsible for the systematic plunder of the occupied countries of Europe, as well as the brutal conditions in Eastern Europe. He was sentenced to death and executed by hanging on October 16, 1946. See http://en.wikipedia.org/wiki/Alfred_Rosenberg for more details. counts. Twelve men, including Rosenberg, were charged on all four counts. charged with waging aggressive war. The Soviet atrocities against their own people before and during the war. widow and a young daughter.